Jaquan Fields is an entertainer and graphic designer, and co-creator of the Relational Strategies project. Jaquan — also known as Quany the Clown — is a multitalented family entertainer who has performed over 2000 shows in the circus arts. Jaquan has trained with greats at the Mid-Atlantic Clown Association and UniverSoul Circus. 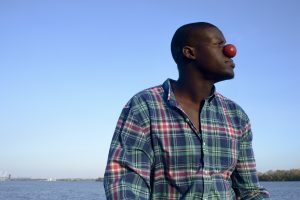 “Quany the Clown” is a North Philadelphia phenomenon: a dancing, juggling, make-you-laugh entertainer born from the imagination of Fields. As a neighborhood artist in the SPACES Artist in Residence Program at the Village of Arts and Humanities, Fields is co-creating and hosting a series of open mics with the “Supa Future Studio” Collective, working to nurture a collaborative spirit among artists in the community.